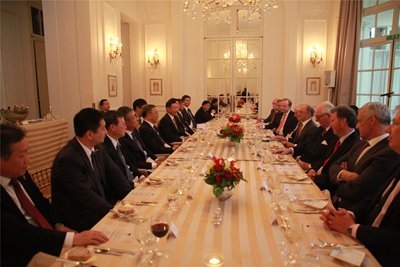 I would like to begin by extending my hearty thanks to Lord Sassoon and CBBC for hosting this dinner to welcome Secretary Hu and his delegation. I also appreciate this opportunity to join business leaders from both China and Britain to renew our friendship and discuss China-UK cooperation. Of all provinces in China, Guangdong ranks No.1 in terms of economic strength and output. It has the longest history of economic cooperation with Britain as well as closest business ties. Such ties between Guangdong and HSBC, Jardine Matheson and Standard Chartered have gone through three centuries. More recently, in 21st century, CGN, Huawei, ZTE, BYD, China Guangfa Bank, and many more competitive Chinese companies from Guangdong are now settling down in Britain. They are here for investment and business. They are here for bringing win-win results to both countries and delivering benefits to both peoples. With this said, Secretary Hu's visit this time will create an even stronger momentum for cooperation between Guangdong and Britain. This will in turn bear more "golden fruits" in the "Golden Era" of China-UK relations. This year marks the 45th anniversary of China-UK Ambassadorial diplomatic relations. This journey of 45 years has been truly extraordinary. This journey reflects the underlying changes in the world political architecture over nearly half a century. This journey is a witness to how Chinese and British interests have become increasingly and closely intertwined. Indeed, the convergence of interests between China and Britain has grown from little to huge, from limited areas to across the board, and from a bilateral scope to a global dimension. None of this would be possible without the commitment of both sides to win-win cooperation. It is the win-win nature that defines our bilateral relationship. It is the win-win cooperation that brings tangible benefits to the people of our two countries. It is the win-win outcomes that keep our relations stable and steadies this colossal ship against potential winds and rains. For years, the CBBC has taken concrete steps to advance the win-win cooperation between China and Britain. Its efforts and contribution have helped build its name recognition across the business communities both in China and Britain. In recent years in particular, the CBBC issued three reports in a row on the Belt and Road Initiative. These reports have played a significant role in defining the Belt and Road as a new area for China-UK cooperation. I highly commend the CBBC's contribution in this regard. "A single branch is easy to snap but a bunch won't be." The future of China-UK friendship and cooperation hinges on the joint efforts of both countries. I hope and believe that with our concerted efforts, our win-win cooperation will contribute more win-win outcomes to the "Golden Era" of China-UK relations. 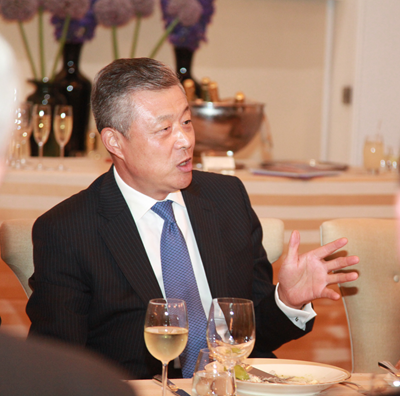 In conclusion, I wish Secretary Hu Chunhua's visit to Britain a complete success!